Among my wife’s family it’s long been held that at their home the Atlantic runs to the back garden while, beyond the small loch on the other side of the house, one can hear the sounds of North Sea breakers piling onto its southern shore. Certainly the two sides feel different. Grey seals tend to frequent the west and north, but on its east and south sides it is predominantly common seals. Similarly the sandy beaches are all on one half, the rocky shores mainly on the other. 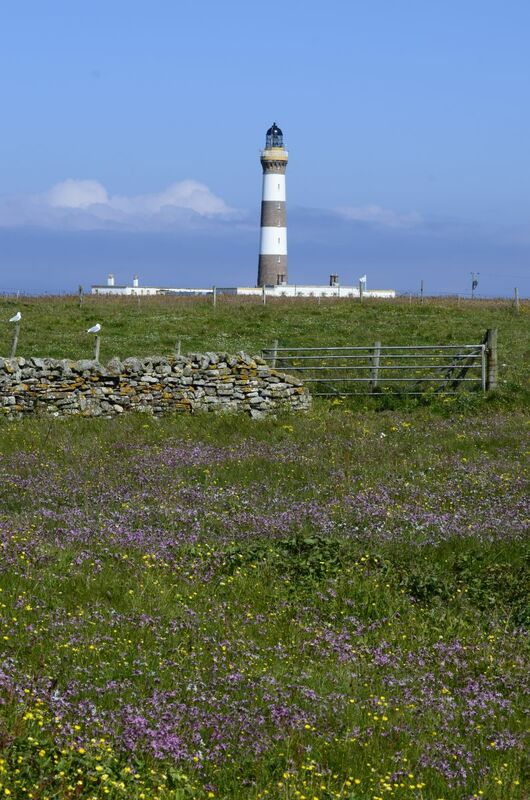 Whatever the truth, this four-mile long place, the most northerly of the Orkney archipelago, is an island apart. It is the perfect spot to detoxify the soul from the endless white noise of modern life. lengths of road running between its pier at the south and the lighthouse at the north. They also link the 60 or so small crofts, many of which are now falling into disuse as the populations drops below 50. Its school houses only a handful of children, there is no shop but a small surviving post office and a relatively recent summer cafe at the northern point. What North Ron has in superabundance is wildlife. Some of the damper meadows are a glorious spread of marsh marigold, ragged robin (10-20% is white flowered), grass of parnassus, northern marsh orchid in a matrix of buttercups. What is most strange is that these plants, which arc across three months of spring and summer in Norfolk, flower all at once on North Ron. Their soft pastel colours are complemented by the one element I think i love most about the island: its sheep dyke, a structured mottled by twelve-mile-long communities of orange and soft-green lichens. 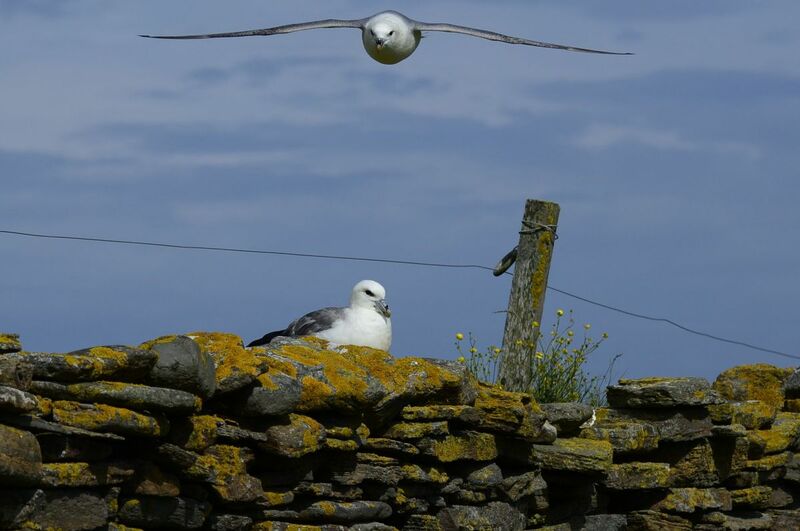 Contrary to its definition here in East Anglia, a ‘dyke’ in Orkney means a wall. And the main wall on North Ronaldsay is the ‘sheep dyke’, built probably in the 1820s to hold the stock, not on the land but off it. The sheep are primitive in appearance and possibly give you a sense of breeds that appeared in Britain during the Neolithic. Long of neck, spindly in leg and slender of body, they can look rather heavy-set, but this is all fluff and air. 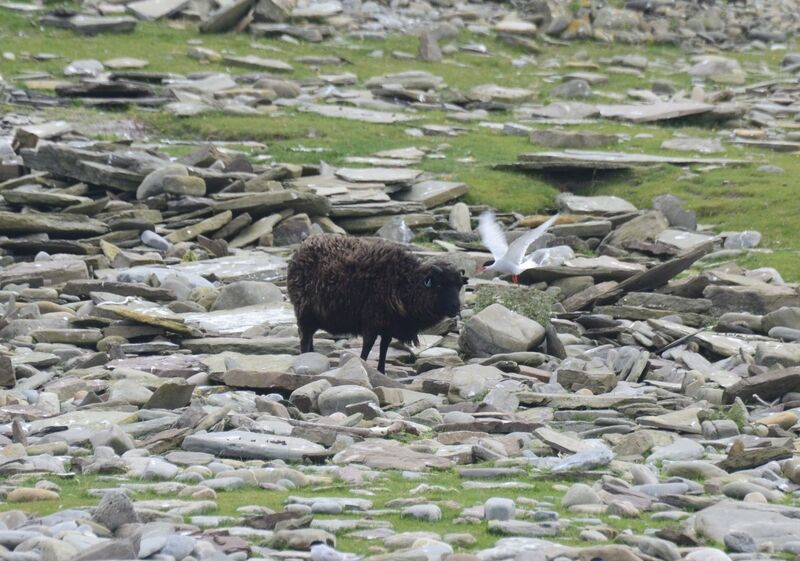 Or at least it is when the fleece is washed, but these sheep spend most of their lives on the seashore eating seaweed and they are what you might expect from stock exposed to salt and spray and winter storm. When young (they are brought in to fields by the crofts to lamb) they are tiny Nativity-scene angels. When old and sea-worn, they are as wild and as unapproachable as the seals. The rams are visually compelling. They have heads like something from a Satanist manuscript with sumptuous curling horns and coats that look like dense felted heaps across their backs. They are the most numerous mammals on the island and in many ways they are its defining characteristic, the subliminal extras in every scene and soundscape. Listen to the sea; you can hear their hooves clattering somewhere on the loose slates by the dyke. Look to the lighthouse or across Linklet Bay; there are sheep grazing on seaweed or following the ‘clowjungs’, the tracks their hooves have worn in the miles of pebble. As I say, the dyke is compelling because it marks the point of transition from the human to the natural, from the cultural to the wild. Inshore are the grazing pastures and the beautiful stonework of the ancient crofts and now the wind turbines and the people. Beyond the dyke is a landscape every bit as wild and untrammelled and as self-renewing as a rainforest. The sheep mediate this boundary and, at times, partake of both landscapes. 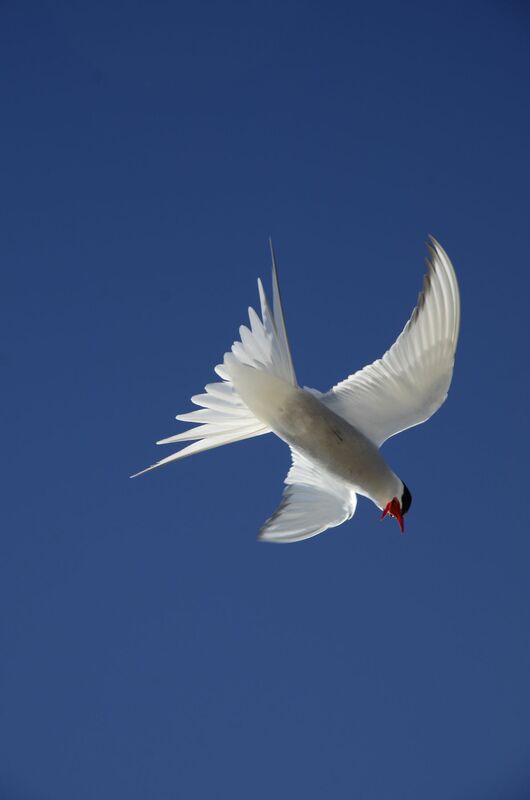 Principally, however, they are creatures enjoying the liberty of the shore, accustomed to the songs of seals and oblivious to the assaults of nesting Arctic terns. Here briefly is a bad pic for proof. 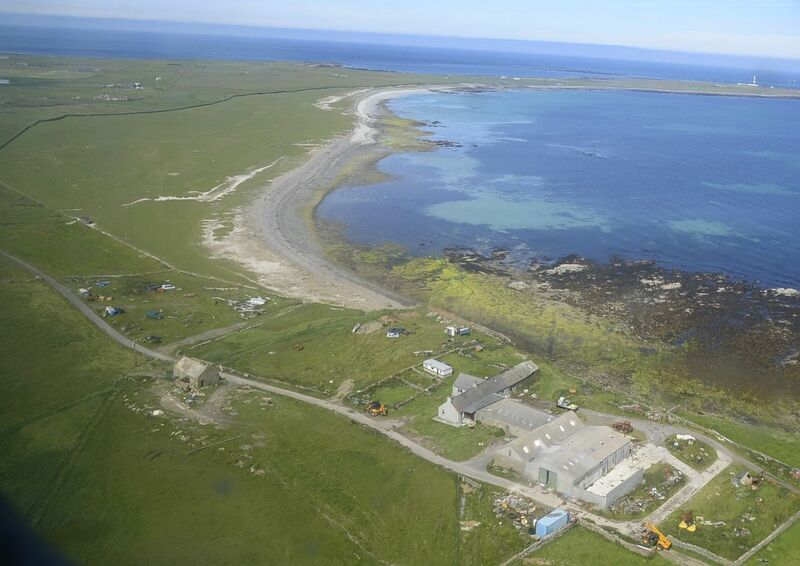 Hereafter is a snapshot celebration of the moving power of North Ronaldsay’s shoreline. 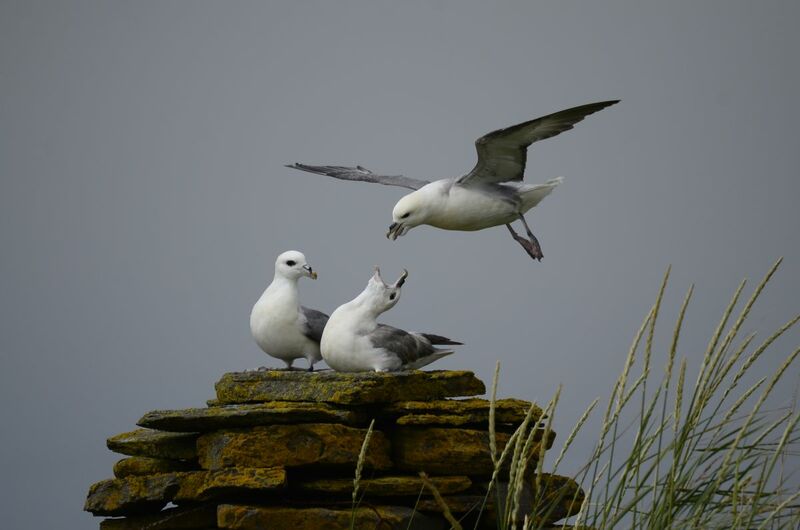 I spent ten days wandering the clowjungs immersed in fulmars and black guillemots and the sublimely quiet colours of sea ivory and parietina and other unidentified lichens and the ferocious skirl of Arctic terns, which have returned to the island in healthy numbers. I never stay on North Ronaldsay but feel instantly at home; i never leave without some sense of being in exile.